Breezy Bags Review & GIVEAWAY!!! This review is going to be short and sweet. Breezy Bags Rock. Plastic bags don't. One plastic shopping bag take 1000 years to decompose in a land fill. Yes 1000 years. We are ruining our home and it's time we stop. The problem with most eco - shoppers, is they're bulky, ugly and hard to tote around. Not a problem with Breezy Bags. These are the most friendly convenient shoppers ever! I love them. There are 5 shoppers encased in a sleeve. Toss the whole thing in your purse, take out as many as you need at the store, unload, shove back in the sleeve, toss back in your purse. It's a breeze! I think that eventually, plastic bags will no longer be manufactured. I think we are at the beginning of that. Until then, do your part and only use re-usable shoppers. Do it for our kids. Again, these are the best looking, most convenient, sturdy eco- bags I've seen. I would recommend buying a set, your Mother will love you for it! In the U.S. we use around 270,000,000 plastic shopping bags in a single day. One person uses more than 325 plastic shopping bags per year. A family of four will use more than 1200 per year. Only 1% of plastic bags get recycled. Paper bags are no better because they use more energy to produce than plastic. There are over 100,000 marine deaths per year due to plastic bag ingestion. It takes 1000 years for a single plastic bag to break down in a land fill. This means they are broken down by light and heat, which causes them to leach harmful toxins into the environment. 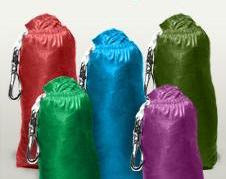 Visit Breezy Bags and tell me why you'd like to use them & tell me what you use now. I'd love to use these because they fold down so small but are so strong and can carry a lot. We use shopping bags now but they get to be quite bulky when you need to do a whole lot of grocery shopping. I would use these bags for grocery shopping and yard sales the most. I love how compact they are and with their own carrying case. The purple ones are sop perfect for me. I entered the PEVONIA giveaway also. I'd love to use them because they are so convenient and take very little space. Right now I use some reusable bags I got from grocery stores. I would love to use these because I could keep them in my purse until ready to use. I love the bright colors too. I use cloth bags now but not as nice. Thank you! They are small and easy to carry. The larger bags that I use from whole foods, target, etc. are not very easy to take with me and I'm always leaving them behind when I go shopping. Because the Breezy Bags are solidly stitched out of maximum strength, minimum weight rip stop nylon cloth , to be the most versatile, eco-friendly, green reusable bags and totes imaginable. I'm using my reusable totes or plastic bags. Entered the PEVONIA-ooh la la Review & Giveaway. I'd like to use them because they can be made so compact. They'd fit in my purse or glove box and I could always have them handy. I have a few reusable hemp and cotton bags now, but they always seem to be full of craft supplies or things I haul around with me. I would use these instead of the plastic bags I use now for groceries and the farmers market. I want them for the obvious reasons (less waste), but also because they store small enough to take with us. We currently use plastic bags (which we recycle) because we always forget the few reusable bags we have. I entered the Happy Green Bee giveaway. I like the fact that they're small and they have a clip on them!! I can just clip them right onto the shopping cart in the store instead of jamming the hodge-podge of reusable bags I have now in the baby seat of the cart. My present bags are pretty beat up and they're a mixture of bags I've picked up here and there. Most of them are ready for the trash. I love how small these get. I'd like to keep these in my purse to use at the grocery store, drug store, farmer's market or library. I would love to use them because they are... reusable! I am not doing too good with not using grocery plastic. I reuse those for garbage disposal and/or recycle, but I need to find a better way! Love how its a small step in the right direction to being more eco-friendly. Right now I try to paperbags I get at the supermarket.